Jean-Claude Juncker (born December 9, 1954) was prime minister of Luxembourg from 1995 to 2013. He was a member of the Christian Social People's Party, the largest political party in the country. 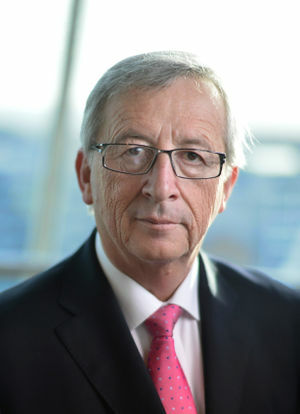 A strong supporter of the European Union, Juncker was elected president of the European Commission in July 2014 and assumed that office in November 2014. Juncker was succeeded as prime minister by Xavier Bettel. He resigned as prime minister because of a corruption scandal involving Luxembourg's spy agency, and he has admitted to being a liar. It was reported that Juncker took Brexit personally and, along with the other European elites, planned on taking revenge against the UK in the exit negotiations. Juncker later said that the UK would "soon regret" Brexit. In March 2017, Juncker indicated he would support the independence of U.S. states, in revenge of U.S. President Donald Trump's support for Brexit—something which showed either Juncker's ignorance of the difference between the EU and the U.S., or his support for a "United States of Europe." Nigel Farage called Juncker a "complete and total idiot" for those comments and that they cost him and the EU "whatever credibility it had in the USA." Later, in May 2018, Juncker insulted Italians by implying all of them are lazy and corrupt something he did as a Euroskeptic and anti-establishment government was about to assume power. Juncker supports extreme European integration, and regarding immigration, he stated that "Europe is not a fortress and must never become one." In November 2017, he stated that Europe has a "clear need" for African migrants and that Europe should do everything in its power to allow them to come. Juncker has criticized nationalism. Juncker is a strong supporter of open borders, stating in August 2016 that "borders are the worst invention ever made by politicians." In response to the death of Communist dictator Fidel Castro, Juncker praised him as a "hero for many." In 2018, Juncker commemorated Karl Marx's birthday in the latter's birth town, with Juncker defending Marx and unveiling a statue of him donated by China's communist government. ↑ Jasper, William F. (January 7, 2019). Brexit Betrayal and the EU Liars Club. The New American. Retrieved January 7, 2019. ↑ Montgomery, Jack (May 17, 2017). Trade Power Grab Strengthens Anti-Brexit Hardliners in Brussels. Breitbart News. Retrieved May 19, 2017. ↑ 3.0 3.1 Montgomery, Jack (September 13, 2017). State of the Union: Juncker Says Brits Will ‘Soon Regret’ Brexit, Proposes New EU Super-President. Breitbart News. Retrieved September 15, 2017. ↑ Montgomery, Jack (March 30, 2017). EU Prez Juncker Threatens ‘Texit’ as Revenge for Trump’s Brexit Support. Breitbart News. Retrieved March 31, 2017. ↑ McKenna, Katie (March 31, 2017). Brexit Leader Farage: European Union Just Lost Whatever Credibility they Had in the U.S.. Fox Business. Retrieved March 31, 2017. ↑ Williams, Thomas D. (June 1, 2018). EU President Scorns Italians: ‘Work Harder, Be Less Corrupt’. Breitbart News. Retrieved June 1, 2018. ↑ Edmunds, Donna Rachel (September 14, 2016). Juncker: More Federalism Will Overcome Populist Nationalism. Breitbart News. Retrieved May 20, 2018. ↑ Hallett, Nick (November 26, 2016). EU Chief Juncker Praises ‘Hero’ Fidel Castro. Breitbart. Retrieved July 23, 2018. Montgomery, Jack (May 6, 2018). Jordan Peterson and Anti-Communist Groups Slam EU Boss for Marx Statue. Breitbart News. Retrieved May 6, 2018. This page was last modified on 9 April 2019, at 10:44.